Monogram Ceramic Address Plaques | Mailbox Collections, etc. Monogram Ceramic Address Plaques. 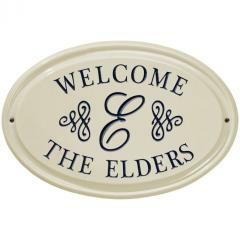 Beautiful, classically designed ceramic personalized house signs. These signs feature your monogram and name ~ a wonderful personalized plaque for your home or business. These personalized plaques are made in ceramic and are completely weatherproof. A great personalized gift to give as a house warming gift or wedding present for the newly weds!